Seaside - Residential district 'Mont Boron', close to the Port and the Old Town - For 2 people - Great standing building " Les Oliviers du Mont Boron ", renovated in 2012, floor 1, panoramic sea view, without opposite, quiet in large garden with swimming pool, south-western exposure. Closed parking. Access internet high speed by wifi and 160 TV channels by optical fiber. All comfort : phone, TV color, hifi, washing machine, dish-washer, tumble-dryer, microwave, furnace, plate induction, electric shutter. Linen and towels provided. Bed double queen size in the bedroom. Sea view since all the rooms and the terrace. Charges included in the prices. Decreasing rates with duration beyond a week (ask me for a customized quote). Booking with secure payment possible (click on " Book Now " on the right). I rent this apartment for over 15 years and I invest regularly to keep the four stars that have been attributed to this touristic furnished accomodation (grading certificate available on request). As such, it is referenced by the Tourism Office of the City of Nice. I specify that I live in the same district which facilitates the reception and any possible help. 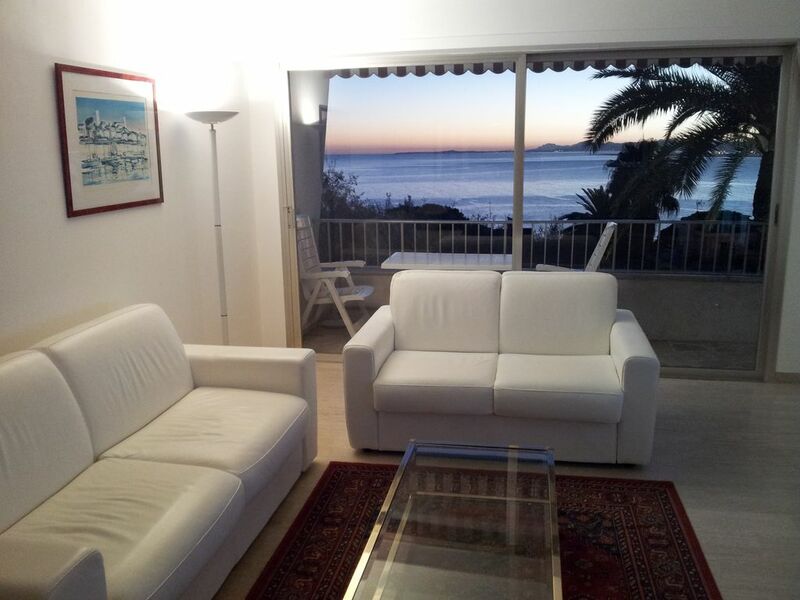 Spacious apartment of 60 m2 (645 sqft) ideally located between Cannes and Monaco : if you want the calm, a real sea view and comfort 4 stars while being near the center of Nice it is here ! - It is in the most residential area of Nice, ' le Mont Boron ' (sea view, greenery and close to the town centre). It is near the sea (300m) and shops (300m). For indication, the Port, the old Nice and the “Promenade des Anglais” (Walk of the English) are in 900 m and the supermarket CARREFOUR Market in only 300 m. If need, 2 bus stops are in 100 m of the residence (bus n°30, 81 and 100). For instance, if you come by plane, you can take the bus n°98 in the airport then take the bus n° 81 or 30 at the place Garibaldi to arrive in the flat. If you want to visit the old town “le Vieux-Nice” or “le Marché aux Fleurs” (cours Saleya) near the “Promenade des Anglais”, you can take the bus n°30 or 81 from the flat. - It offers luxury services (classified 4 stars by the City hall of Nice) and a living space of 60 m2 / 645 sqft (include there a terrace). It is ideally directed, all the rooms and the terrace look out on to the sea (southwest orientation). - It has a beautiful sight panoramic sea on 180 °, the evening, the park is lit with in back - bottom the lights of the Walk. It is without opposite and is quiet. It is to note that the big bays glazed by the stay allow to take advantage of the sea view throughout the stay. - It can receive 2 people (bedding : 1 big bed 160x200 cm for two in the bedroom). - It was renovated in April 2012 and all the kitchen is new (pieces of furniture Schmidt, dishwasher, washing machine, tumble dryer, pyrolise oven, big fridge freezer, induction cooker, microwave oven, extractor fan, toaster, etc....). - It possesses a closed parking and an free access to high speed internet WIFI and to 160 TV channels including 30 in HD by the optical fiber (46' full hd led ultra slim television). - The swimming pool is belonging to the residence and is placed in the middle of the park with olive-trees and palm trees and in front of the sea. Beautiful wiew in a very nice flat. This was a very nice place up in the hill. Would warmly recommend. The wiew was beautiful and everything in the flat worked without any problems. In Finnish: Hieno asunto kauniilla, upealla näköalalla. Vaalea sisustus ja moderni keittiö. Perhemme nautti olostaan ja kauniista maisemista. Hyvät linja-auto yhteydet kaupunkiin ja lähiympäristöön. Hyvin varusteltu kauppa sijaitsee n. 300-400 m päässä. In Swedish: Underbar bostad med ljus inredning och modern kök. Kan varmt rekommendera bostadet som har en underbar utsikte över havet. Buss förbindelserna är bra till centrumet och näromgivningen. Butiken ligger nära, ca 300-400 m ifrån. "This appartement is light, modern equipped and comfortable - we were really pleased by our choice. The appartement represents the 4* accommodation, and I can only agree with it. Maybe I would not recommend it for 4-5 persons as the advertisement says, as it might be too crowded. Although, it is not located very close to the city centre (30 min. walk up to the mountain), the balcony view on the seaside was stunning, and it is definitely worth it. The appartement is situated in the calm residential area surrounded by beautiful parc. There is a supermarket is nearby (300m), therefore, you do not have to worry about getting every day fresh grocery. The owner was also very friendly and helpful, we had everything we need. Thank You! I will never forget this amazing view and will be happy to come back again!" "I would like to specify that the flat is big enough to receive 4 or 5 persons with a living area of 60 m2 (645 sqft) and it’s situated on a hill and not in a mountain, just above the harbour of Nice." "After a 2 week stay at this accommodation, we were very happy with the quality of this apartment. It was very clean, quiet, secure and relaxing. The only problem we found was getting the bus drivers to stop for us at the bus stop!! We wouldn't hesitate to stay at this apartment again in future."